Exercise is Eating. Are you Eating Enough? A great trainer is not someone who is “perfect” and NEVER makes a mistake, but one who is willing to ADMIT IT WHEN THEY ARE WRONG and make the necessary changes. Unfortunately, many trainers and health “professionals” practicing today, are still teaching and promoting ideas and strategies that are not only outdated and fallacious, but may even be HARMFUL to our bodies and health. If your trainer tends to spout “facts” that they cannot support with sound scientific principles, it’s highly likely that they are getting their information from non-credible sources—like muscle magazines, internet sites, their friends, or the buff guy or gal in the gym! Some health “experts” probably just make some of this nonsense up!! It’s important that your trainer not only be certified by an accredited personal training agency, but that they stay up to date on the latest and cutting edge research. Many trainers are just not interested in spending this kind of time. They feel that whatever worked for them in the past should work just as well today. While this is partially true, it is also half false. Many of the diet and training strategies utilized in the past have been proven to not only be highly ineffective, but even unsafe. In other cases, the practices they endorse are not harmful or ineffective—it’s just that NEW METHODS HAVE BEEN DISCOVERED THAT ARE EVEN BETTER!!!! Why not utilize new information for improving fat loss and health that is faster, safer, and more effective?!! This does not necessarily make them a “bad” person. The fact of the matter is that trainers are fallible too, make mistakes, and do not know everything. If they do claim to “know everything” then I think you have another problem on your hands—LOL! But hubris and pride aside, hopefully your trainer is open to opposing views and respects your right to disagree—(just be sure you are also prepared to back up your viewpoint with solid evidence and facts). If your trainer is teaching you one or more of the following “Ten Diet and Exercise Myths,” you may want to confront them…either that or find a new trainer!! Rather than write fifty pages of evidence to support the following myths, I’ve decided to point you to the resources you can check out to view this evidence for yourself. Some of the resources I’ve attached are video links…others are articles or studies. I encourage you to explore these issues further. If you’d ever like to discuss these issues with me in person or via e-mail or blog, I’d me more than happy to oblige. They can only choose one bag. They have to make their choice without looking in the bags. They can eat the entire contents of the bag over the course of the day, but nothing else. Both bags contain similar amounts of calories, so either one should theoretically be equally effective at helping them to lose weight. They’d have to eat only what was in the bag they choose every day for a whole month! They are not allowed to look in the bag, but I do allow them to hold each bag in their hand before choosing. Most are amazed at the difference in the weight of the two bags. The green bag is very heavy, while the purple bag feels almost like there’s nothing in it! The purple bag weighs about the same as your cell phone. Invariably, everyone chooses the heavy green bag. Why? Remember, I told them that either bag would be effective at helping them to lose weight. So no matter which one they chose, they have no choice but to lose weight. So they are not making their food choice based upon weight loss. They also cannot see what is in the bags, so they cannot be making their selection based upon hedonistic value (pleasure) So if they are not making their choice based upon weight loss or pleasure, what ARE they basing their selection on???? Why is everyone choosing the same bag?! Here’s why: Whether we realize it or not, we humans are instinctively hardwired to eat more whenever we can. Eating “more,” however, does not always mean the same thing for everybody (as we’ll see in a minute). Just because you eat more food, does not mean you ate more calories! Here is where I prove it! Truth be told, the “weight” and “volume” of specific foods may be one of the most crucial components of weight loss that exists!! It’s highly likely that if you do not eat high-volume, low-calorie food on a regular basis, this may be one of the primary reasons you are not losing any weight (more specifically—body fat)! Let’s take a peek at the weight of each bag and the calories they contain. I weighed and measured each item on my food scale in grams. The purple bag contains 1,890 calories while the green bag holds 1,805. However, there is one major difference between the two bags. The purple bag (the one containing 1,890 calories) weighs only a mere 1.2 pounds. The green bag, however, weighs a whopping 12 pounds!!!! Even more surprising is the fact that the bag weighing 12 pounds is actually the bag that has fewer calories in it—(85 calories less). I’ve replicated this experiment on other occasions where the heavy bag weighs almost twenty times the weight of the lighter bag while calories remained almost the same!! 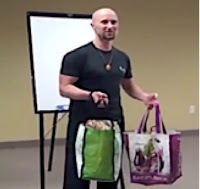 If you were to look inside the two bags, you’d find that the purple bag (the light bag) holds: 3 protein bars, two slices of thinly-sliced prepackaged cheese, a small handful of walnuts (52 grams), and a handful of dried apricots (79 grams). These are not even foods that most people consider “bad.” Imagine what it would have been if I had filled it with M&M’s and ice cream! Altogether the whole amount came out at 1.2 pounds and a whopping 1,890 calories!! The 12 pound bag, however, was loaded with raw plant-based foods (mostly veggies) and raw fruits—only 1,805 calories!! You simply cannot get fat eating nothing but fruits and veggies!! I’ve heard trainers say (and I know that I have been guilty in the past of saying this myself) that “it doesn’t matter how healthy you eat if you eat too much. You can still get fat on celery and broccoli if you eat too many calories.” I know now that this is complete and utter nonsense! No-one is EVER going to get fat eating exclusively broccoli and celery!!!! It’s impossible!!! It’s not the broccoli and celery that is making us fat; it’s the peanut butter on our celery and the cheese melted all over the top of our broccoli!!! It is not potatoes and rice that is making us fat; it is the sour cream, bacon bits, melted cheese, oil, and fatty sauces we put on top!! The fact of the matter, folks, is that the leanest and healthiest populations in the world eat HIGH CARB diets! Cultures that eat predominately starch-based diets (like potatoes and rice) and veggies are the leanest and healthiest, despite what the high protein gurus may say. Most dieters that count calories simply try to eat less of the wrong foods. GOOD LUCK WITH THAT!! When you try to eat less of high calorie foods, you’re left with only a very small quantity of food you can eat each day. No-one can stick to that kind of diet for very long!! However, if I told you that you could eat 12-20 pounds of food EVERY DAY, most people would find that practically impossible!! That’s part of the reason why eating a mostly whole food, plant-based diet is so effective at helping people lost weight without having to count calories or points. Consider several examples: In order to get the same number of calories from raw spinach as one large bag of tortilla chips (approximately 1,400 calories), you’d have to eat not 2 boxes, not 5, not 10, or even 15, but 20 BOXES OF SPINACH!!! Who could ever eat that much spinach?! Not even me! Someone may respond with, “Yeah, but aren’t tortilla chips carbs?” Firstly, NO! If you look at the percentage of fat that is found in most commercially available chips, it is largely fat from processed vegetable oils (almost 56%). Secondly, tortilla chips are an example of a processed food—precisely the kinds of food we are trying to avoid! Eating a “vegetarian” or “vegan” diet is no guarantee of health or weight loss if the majority of foods come from processed, high-fat, plant foods. We are talking about a diet high in whole, lots of raw, plant-based carbohydrates that are low in fat (around 10-20%) and moderate in protein (10-25%). In her research, Barbara Rolls discovered that “weight” and “volume” of food was more important than “calories” when it came to losing weight. Barbara understood that some foods are very small when it comes to “volume” while still packing a caloric punch!! Take Brazil nuts, for example, like all nuts, they are very small but contain many, many more calories per gram than most other plant foods. Brazil nuts clock in at 6.6 calories per gram. That means to consume 100 calories of Brazil nuts would only be about 15 grams of food. If, however, we wanted to get 100 calories from fresh, raw blueberries we’d have to consume 175 grams of food!! That’s 15 grams of food compared to 175!! This means that Brazil nuts have almost 12 times more calories per gram than blueberries!! Or, another way to look at it is that you could EAT 12 TIMES AS MANY BLUEBERRIES AS BRAZIL NUTS to reach the same number of calories!! Eating blueberries will never make you fat, but a small handful of nuts can add up quickly!!! Barbara theorized that it was the “volume” of food that was determining how much you were eating more so than the number of calories contained in those foods. She reached this conclusion because her research found that even when you radically change someone’s diet, they still tended to average out around the same weight of food consumed each day. So, for example, let’s say that right now you average about 5 pounds of food each day. If the entire five pounds of food you ate came from exclusively blueberries that would only be 1,294 calories. If, however, the same volume of food was eaten from Brazil nuts alone, that would come out to 14,982 calories!!!!!!!!! If you ate five pounds of raw spinach, on the other hand, it would only come out to 522 calories!!! So you can see that if Barbara is correct, WHAT kind of food you eat is far more important than HOW MUCH! Many people eating “healthy” salads load up their greens with oil-based dressings, cheese, nuts, bacon, croutons, and dried fruit—all very calorie dense foods. Just one tablespoon of olive oil, for example, has 120 calories. Per gram, refined oils come out at 9 calories per gram!! That little dabble of oil on your salad may be where more than 85% of your calories are coming from!! …was entitled “A Mouse Model of Metabolic Syndrome: Insulin Resistance, Fatty Liver and Non-Alcoholic Fatty Pancreas Disease (NAFPD) in C57BL/6 Mice Fed a High Fat Diet.” The study took two groups of mice and fed them entirely different diets for 16 weeks to see what impact “THE KIND OF FOOD” they ate would have on their health. Both groups were allowed to eat as much as they wanted, but the “QUALITY” of the food in each group was very different!! One group was fed a high-fat, low-carbohydrate diet of 60% fat, 14% protein, and 26% carbohydrate respectively. The second group was fed a high-carbohydrate diet, low-fat diet (normal rat chow) of 76% carbohydrate, 10% fat, and 14% protein. So both groups received identical amounts of protein; only carbohydrate and fat were altered. The vitamin and mineral content of both diets was identical. At the end of the 16 weeks, the mice eating the high-fat diet were in bad shape. They were metabolically displaying the same health concerns seen in most obese humans. What’s interesting is that the scientists actually wrote in the study that “Food intake was not different between the groups, but both the energy (+38%, p<0.05) and fat intake per animal (+729%, p<0.001) were greater in HFC (high fat chow) mice than in SC (standard chow) (Table 2). Feed efficiency (body mass gain in grams per kilocalories consumed) was therefore greater in HFC mice than in SC mice (Fig. 3).” So basically the researchers found that the mice eating the high-fat diet ate about the same “VOLUME” of food as they had on the low-fat diet. The only thing was that the calories in the high-fat chow were much higher than they were accustomed to and they subsequently got very fat—very quickly!! Eating a large volume of food is really how we are designed. It is the way our natural ancestors have been eating for thousands of years. However, we are designed to eat foods very low in “calorie-density.” Fruits and veggies are the least calorie-dense foods on the planet! Animals that are plant eaters (especially those designed to eat fruit like us) are known to eat many pounds of food in a day. Adult chimpanzees typically weigh somewhere between 57-120 pounds. By some estimates they regularly consume about 9-13 pounds of food a day. An adult gorilla (about 2 1/2 times the size of a man at close to 400 pounds) eats around 45 pounds of food a day. If we wanted to eat like a gorilla or chimpanzee, we could roughly estimate how many pounds of food they eat per pound of body weight and come up with a close approximation for ourselves. If we average the chimpanzee diet, it comes out to around .075 pounds of food per pound of body weight. The gorilla eats about .113 pounds of food per day per pound of body weight. Averaged together, these come up to around .094 pounds of food per pound of body weight per day. Based upon this number, an adult male weighing 170 pounds would need to eat approximately 16 pounds of low-calorie, high-volume, plant-based food a day to maintain his weight! This lines up with many of the plant-based diets that I have entered into our nutritional tracking software to provide sufficient macro and micro nutrients. Some days I came up with over 18 pounds of food I could eat!!! We don’t get fat because we eat too much; we get fat because we eat too little—but too little of the “wrong kind” of food! Our digestive systems and biochemistry are optimized to run on fresh raw fruits and leafy green veggies (primarily). Other food stuffs, like nuts, seeds, legumes, grains, starches, meat, and dairy should only be consumed in sparing quantities or not at all. Heaven forbid we are consuming processed junk food filled with fat and sugar!!!! The “kind” of food we eat is very important as well as the volume, but we still must go deeper!! Consider a 360 calorie piece of baked tilapia (fish) versus a 360 calorie doughnut. If calories are really all that matter, then it really shouldn’t matter which food you pick as long as you don’t eat more than you need of either one. However, is this really true? If we look at the effects of each food on our health and weight, I think most people would admit that common sense would say NO! The baked tilapia is low in fat and high in protein, whereas the doughnut is high in fat and sugar, but low in protein. Aside from fiber, protein is one of the most difficult macronutrients to digest. In fact, close to 30% of all calories consumed from whole food proteins (not protein powders) are lost as “heat energy” (dietary thermogenesis) just trying to break the protein-rich food down. This means that a 360 calorie piece of tilapia actually only equates to approximately 252 calories that are actually absorbed by the body. The doughnut, on the other hand, is very efficiently broken down and stored with little-to-no dietary thermogenesis. This means that almost 100% of the calories consumed from the donut will be absorbed—the whole 360 calories!! Who do you think will lose more weight—the person who eats the 360 calories from fish, or the person eating the doughnut? They both “ate” the same number of calories, right? However, “eating” and “absorbing” are two different things! It doesn’t matter how much you eat; it matters how much you absorb! So who loses more? That’s right—the fish!! So you tell me—does “quantity” (how much you eat) really matter more than the “quality” of the food you eat? I don’t think so! Fiber is so effective at preventing the absorption of calories that many animals that eat high fiber diets must eat enormous quantities of food in order to survive. If we consider the diet of an elephant, for example, we can see how astounding this is. An adult elephant can weigh anywhere between 5,000 to 14,000 pounds. They are known to eat between 300-500 pounds of food a day and drink close to 50 gallons of water. However, of the 300-500 pounds of food they regularly consume, they are only able to absorb around 40%! That’s interesting. This means that if an elephant were to eat 15,000 calories in a day, their body would only be able to absorb around 6,000 calories!! If that’s true (and it is), where in the heck did the remaining 9,000 calories go?!!!!! You guessed it—in their poo!! The elephant was unable to absorb many of the calories it ingested largely because of the fiber content of the meal. Because the elephant eats exclusively RAW food, the thermic effect of breaking down the food was also much greater (meaning it was more difficult to digest). Researchers, Rachel Carmody and Richard Wrangham, from Harvard University have demonstrated that even if calories remain EQUAL between two groups of animals, those eating exclusively raw food will lose far more weight than those eating cooked food. Eating more raw food that is high in fiber is an excellent strategy for losing weight! While we certainly would not want to try and eat as much fiber and raw food as an elephant, we can still acquire many of the same benefits by even small changes. Animals that are very much like us (most primates) eat diets that are exclusively raw foods and high in fiber. The take away: Eat more fibrous fruits and veggies, small amounts of protein and reduce sugar and fat in the diet. When you eat, blood flow to the digestive tract reduces oxygen to the rest of the cells in your body. The immediate response of the brain is to try and get you to slow down—i.e. take a nap—so that it can focus its energy on digesting your meal!! How many of you feel like running a marathon after eating a large Thanksgiving meal? Yeah, I didn’t think so! A “small” breakfast is ideal. Don’t overdo it. All the women in the group were on a calorie restricted diet. All the women in the group ate the SAME NUMBER OF CALORIES (1,400) regardless of their metabolic rate or whether they ate a large or small breakfast. The study was only 12 weeks in length—it never went on to prove that the women in the study were able to stick to their calorie reduction plan or large breakfasts. We see that the size of breakfast had nothing to do with whether or not you lost weight—UNLESS YOU WERE COUNTING CALORIES!!!! The TRUTH is that some of the leanest and fittest people on the planet do not even eat breakfast!!! It’s true!! Check out this website and the testimonials. All the science is posted as well. The author, Martin Berkhan, is a strong proponent of “intermittent fasting” as a fat loss strategy that often involves skipping breakfast. I’ve used intermittent fasting myself to drop almost 10 pounds of fat in one week!! It works incredibly well if you do it smart and safely! Check it out here! For this one, I’m just going to default to Martin again. Check out his “Top Ten Fasting Myths” page on the website. The fact of the matter is that the body will increase metabolism proportionate to whatever size meal you eat, not because you eat more often! The fact is that most of us are EATING FAR MORE PROTEIN THAN WE NEED!! So much so, in fact, that it is causing us tremendous harm and possibly an early and painful death! Once again, another big fat lie!! Carbohydrates are rarely ever converted to any significant quantity of fat in the body (unlike the fat we eat) unless in very extreme eating situations that most humans would not subject themselves to daily. The same goes for dietary protein. The fat we eat, however, is very efficiently stored as fat in our bodies!! Oh yeah…one more thing: The most successful long-term weight loss maintainers (participating in the National Weight Control Registry) eat a low fat diet (less than 25%)!! Sorry Folks! This one is false as well! Eating fat does not increase satiety. In fact, many studies demonstrate that it does just the OPPOSITE—especially certain “KINDS” of fat!!! Your trainer was wrong again; what can I say?!!! The thing about fat is that it’s also a myth to treat all fat as good or bad. There are actually many different kinds of fat. Some fats are very good for us…in fact they are ESSENTIAL. That’s why they are called “Essential Fatty Acids.” We need plenty of these in our diet. It’s the other kinds of fat that we really want to reduce. If you ever get a chance to read the book: “The End of Overeating” by Dr. David Kessler, or the “Pleasure Trap” by Dr. Doug Lisle, you’ll get some even deeper insights into why adopting a low-fat diet is ideal for weight loss and why fatty foods actually increase your desire to overeat. Hopefully by now you know that this one is false too. We’ve already looked at why counting calories is not necessary nor ideal to lose weight. We’ve seen that Leptin is more responsible for controlling body fat percentage, weight, and physical activity than “willpower,” “structured exercise,” and/or “calorie counting.” You do not need to “eat less” to lose weight…in fact you should do just the opposite by eating more low-fat, low-calorie fruits and vegetables. As far as exercise, progressive weight training is the most effective fat loss training you can do!!! LIE, LIE, LIE!!! Tell that to a heroin, alcohol, or crack addict!!! “Just consume a little less.” That’s crazy!! The addict knows that “avoidance” or “abstinence” is what they need to do—not “portion control” or “moderation!” Certain “kinds” of food are not only addictive but makes us feel hungrier. We have to implement strategies effectively reduce or eliminate these kinds of foods—not portion control!! !